Investors have some big questions heading into the retailer's holiday-season quarterly update. Nike (NYSE:NKE) shareholders are hoping they won't receive a lump of coal from their company this Christmas season. The footwear and apparel giant is scheduled to post its fiscal second-quarter results on Dec. 20, right in the middle of the peak holiday shopping period. Its last two reports for this period were disappointing for most investors since they showed declining sales in the core U.S. market and falling profitability. Expectations are for a much better outing this time around. Let's take a closer look. Nike likes to bill itself as a growth company, but lately, that's only been true on a global basis. The retailer endured sales declines in its core U.S. market in each of the last two fiscal years that were offset by bigger gains in places like China. Things are finally looking up in Nike's home market, though, with sales gains accelerating last quarter to a 6% rate from 3%. Part of the reason for the rebound is that the company did the hard work in 2016 and 2017 of getting inventory levels back in balance with slower demand trends. But the bigger driver has been innovation, with popular new product releases spanning its footwear and apparel categories. These launches have helped Nike outperform Under Armour (NYSE:UA) (NYSE:UAA), whose U.S. sales are still trending lower. Investors will be looking for continued positive momentum here as Nike solidifies its growth rebound in its core market while growing slightly faster internationally. 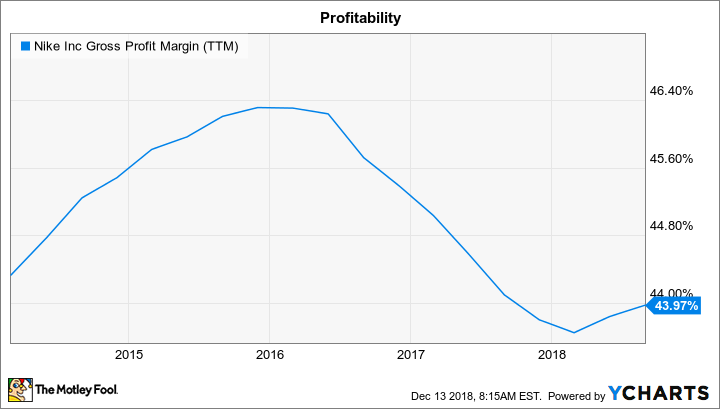 Declining gross profit margin was one of the first indicators that Nike's sales trends were weakening beginning in late 2016. The slowdown forced the company to slash prices to get through slow-moving inventory, after all. As a result, the metric has worsened in each of the last two years, dropping to 43.8% of sales from 46.2% in 2016. Lately, investors have seen an encouraging stabilization in that trend that they'll be looking for Nike to extend. Management has predicted as much, saying premium footwear platforms like Nike Air, plus the shift toward direct consumer sales, promises to lift profitability this year and well into the future. On the other hand, a surprisingly competitive holiday shopping season, or a flat reception for some of its latest products, could reverse last quarter's margin boost. The good news is this circumstance is less of a risk than it was in recent years because Nike's inventory position is much slimmer heading into the holiday period. Rival Under Armour recently issued a conservative forecast for the new year that calls for sales to end up flat in the core U.S. market and to rise by a modest 3% to 4% overall. Nike's executive team will issue their own guidance update on Thursday, and investors are hoping for better news from the industry leader. As of late September, CEO Mark Parker and his team were calling for global sales to grow by about 10% in fiscal 2019 to mark a significant boost over last year's 6% uptick. Gross profit margin is expected to rise for the first time in three years, too, including with a modest increase this quarter. Nike will update both targets to reflect the latest shopping trends in the U.S. and in key outside markets like China and Europe. More market-thumping growth would be good news for the year ahead, but also for the long term since its cash flows are helping Nike make aggressive bets in areas like branding and direct-to-consumer sales to solidify its lead over industry peers.